This Scott 2-ply toilet paper is made from 100% recycled fiber, that provides a high quality, eco-friendly toilet paper option for any location. Meeting and/or exceeding all EPA standards for minimum post-consumer waste content tissues, Scott 100% Recycled Fiber Standard Toilet Paper contains 100% recycled fiber and 75% post-consumer materials. Packaged in a combination of 34% post-consumer and 55% recycled fiber, the core contains 100% post-consumer, paper wrap contains 90% recycled content, 10% post-consumer. 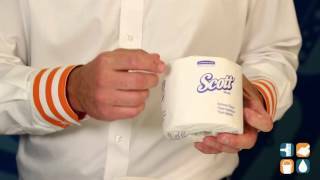 This Scott toilet paper provides thickness, strength, reliability and softness that other recycled fiber toilet paper cannot match. 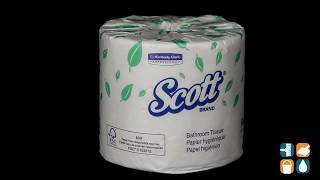 Purchase Scott toilet paper in bulk and save! 4" x 4" Sheet size, 506 Sheets per Roll, 80 Rolls per Carton.